A blog about parenting, beauty, lifestyle, and just straight up living. Hey everybody! So I am a major YouTube junkie. There is such great content out there! So I will be creating regular posts that feature 5 awesome YouTube channels of a certain category. This week I will be feature beauty channels. These YouTubers are people who create fantastic videos filled with beauty tips, tricks, and tutorials. The ones I will be featuring are just a few of many, so there will be many more features to come! Bubzbeauty was created by Lindy Tsang who is from Northern Ireland. She is easy to listen to because she has a really soothing accent! Besides that she has a mixture of awesome videos from makeup tutorials to DIY face masks. She has a large archive of really good content. If you do not know who Michelle Phan is, you may have been living under a rock. Phan is well known for her immense success with YouTube. She has created multiple multimillion dollar companies stemming from her YouTube channel yet continues to make great videos. The majority of her content is makeup tutorials, but she does have quite a few fantastic DIY beauty videos. Kandee is a gem. She is extremely genuine and so very talented. Originally a celebrity makeup artist, Johnson now creates makeup tutorials on a regular basis as her day job. She is just straight up amazing. Even if you are not interested in makeup tutorials for yourself, if you want to watch some crazy awesome videos, check out her costume makeup videos, where she transforms into all sorts of characters from Justin Bieber to Barbie. April is a very kindhearted person who is very relatable. She has many types of videos but her main ones seem to be hauls and reviews on beauty products. It is nice because she reviews both drugstore as well as high end beauty products. Kayley is a professional hair stylist. She is very talented and has a lot of unique hair tutorials to check out. She is very easy to follow and you can learn how to do a lot of seemingly complex hairstyles without a lot of hassle. 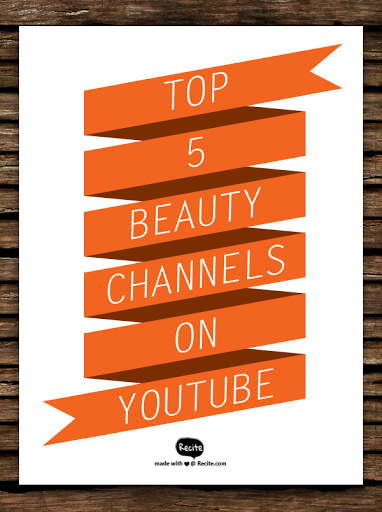 So those are my five beauty gurus on YouTube that you NEED to check out! Let me know, who are some of your favorite beauty YouTubers?